A day after the Federal Police Commissioner Jemal Zeinu thanked, Querro, an ethnic Oromo youth group seemingly linked to regional authorities and Oromo Liberation Front (OLF- a radical ethno-nationalist opposition party with over 40 years of age), for a peaceful reception ceremony for OLF leaders in Addis Ababa, at least 60 Ethiopians are reportedly massacred in Burayu – a town within Oromo regional state- outside of the capital in the last two days.Many others are wounded but the exact figure is not confirmed by government although it admitted that there was “a problem in some Oromia zones.” Government affiliated media estimates of death toll from the attack is between 25 and 30. Hundreds are displaced and flocked to the capital. Politicized Ethiopians tend to take the words of the regional police commissioner, who also stated that his forces were unable to control the situation due to the topography of the region where the attack took place, rather as a mockery as they believe that the massacre planned and targeted specific ethnic groups and had a political motive. It is something that could have been averted, for Ethiopians. Gamos and Guraghe’s are among ethnic groups that were targeted. Victims of the attack and the killings says that they were told to leave the region which makes the attack a form of ethnic cleansing. Why the police force, which was rather supposed to foresee a large-scale attack like what has happened in Burayu, failed to react to the situation to protect civilians is the question that many Ethiopians could not get an answer from the administration. Based on information from social media and other Ethiopian media outlets, one of the victims was a pregnant woman who was rapped and whose husband was killed by the same Querro group a day before she died in hospital in the western parts of Addis Ababa. Verified video footages and pictures widely shared on social media suggest that the massacre exhibited barbaric tendencies. 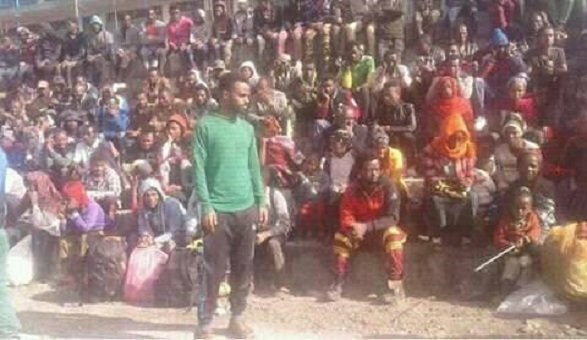 Ethiopians took their outrage to social media and are demanding the government to protect the safety and security of Ethiopians in Oromo region of Ethiopia. Prime Minister Abiy Ahmed reportedly condemned the killings and stated that “government will take measure on those who perpetrated the attack.” He is in Saudi Arabia where he was awarded a medal, along with Eritrean President Isayas Afeworki, for a peace deal with Eritrea. Ethiopians are noticeably weary of Prime Minister Abiy Ahmed’s government for failing to control widespread anarchism which seem to emanate from dual power exercised in the country since be became the prime minister of Ethiopia. A youth movement led by activists based in overseas (like Jawar Mohammed) is asserting de facto power and disrupting government power in different parts of Ethiopia. 2 Responses to "Radicalized Oromo Ethno-nationalists allegedly massacred at least 60 Ethiopians near Addis Ababa"
Killings bring evacuting all ethiopians and making free it for non_ Ethiopian colony or empty deseret area, so we never be foolish to kill ours Ethiopian. Now you reported when Amhara is bited by Qeerroo.why you never reported the killings of Others by Qeerroo in Oromo region from last year till recently?